Jet skis are a common sight during the summer months at Last Mountain Lake in Rowan's Ravine Provincial Park in Saskatchewan, Canada as this is a paradise for water enthusiasts. 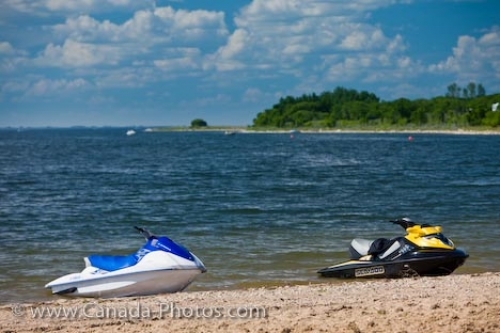 Two jet skis have been parked on the beach, allowing the riders to take a break and partake in other activities such as swimming, tanning, fishing, canoeing, golfing, volleyball or simply relaxing. A campsite sits along the shores of Last Mountain Lake making it easy to wander back and forth to the beach with all the necessities such as umbrellas, coolers, beach toys, floating devices and chairs. Jet skis, canoes and boats are easy to launch along the lakeshore as the sandy beach has plenty of space for it. Last Mountain Lake is approximately 2 kilometers wide and 70 kilometers long giving everyone ample space to enjoy their vacations without being crowded amongst other groups of people. A full service marina is located along Last Mountain Lake as well as a mini golf course and a restaurant. Picture of two jet skis parked on the shores of Last Mountain Lake in Rowan's Ravine Provincial Park in Saskatchewan. Jet skis on the shores of Last Mountain Lake, Rowan's Ravine Provincial Park, Qu'Appelle Valley, Saskatchewan, Canada.